Andrew Garfield is poised to make his debut as Spider-Man when “The Amazing Spider-Man” hits theaters on July 3, but according to the young man’s parents, fame hasn’t gone to his head. 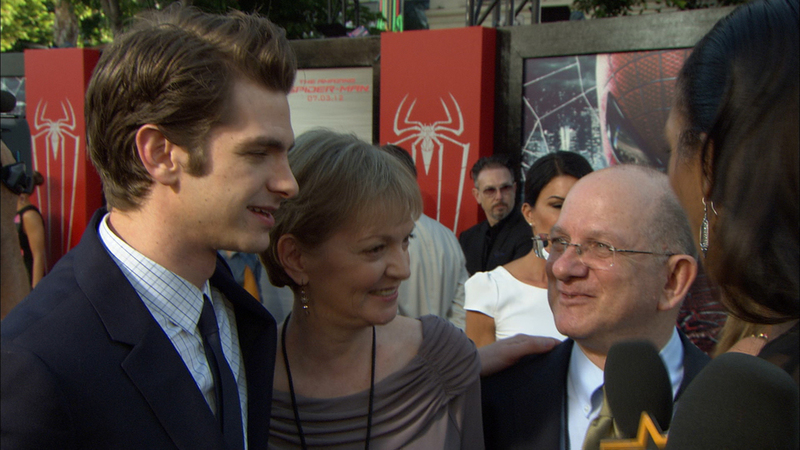 Andrew’s dad and mom – Lynn – joined their son on the red carpet on Thursday and spoke about the day their baby called them up and told them he got the gig as Spider-Man. Andrew’s mom, Lynn, actually made that first Spidey costume. “[It was a] good costume. It was a genuinely good costume and much more comfortable than the one I’ve been wearing for this movie,” Andrew laughed. Andrew sent the picture of his toddler self in the homemade costume to his reps who actually passed it on to director Marc Webb. “They were shameless enough to send it to, to the director,” Andrew said, noting that it helped firm up in the producers’ minds that he was the right man to do the red and blue Spidey suit. “I think that they were reassured that I was a fan, you know? That makes a huge difference and, it means they knew I’d work as hard as I possibly could,” Andrew said.